Please consider a gift to the Amherst Central Alumni Foundation on Giving Tuesday! The Amherst Central Alumni Foundation, through generous donations from alumni, provides financial support to programs which enhance the student experience throughout Amherst Central School District. The foundation is an independent 501(c)(3), not-for-profit organization. Our donors help bridge the gap between basic funding and what Amherst students need to truly excel. Since 2003, our grant program has given almost $100,000 to the Amherst Central School District. Please share with your Amherst family and friends! You can donate directly through PayPal button below. New for 2018! You can donate through Facebook. If you donate via Facebook on giving Tuesday, they will be matching donations. Facebook doesn't charge us a fee for collecting donations through them. Below is a link to our donation form if you would like to print and use. 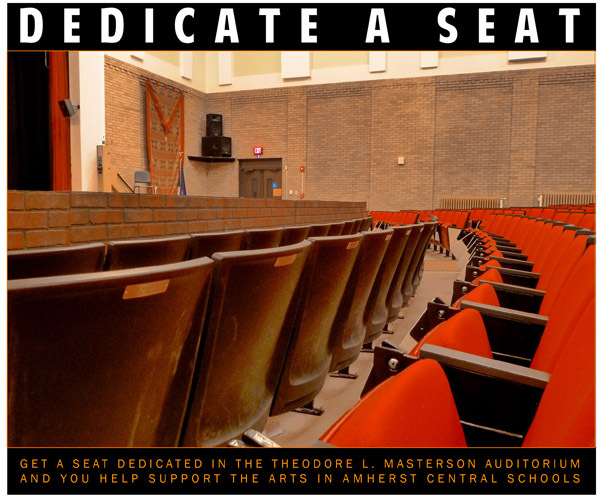 The Amherst Central Alumni Foundation is helping the arts in Amherst Schools by offering seat dedications on the back of seats in the Theodore L. Masterson Auditorium in the high school. Funds raised go directly to programs in the school through our foundation grant program. Your donation includes an engraved name plate on a seat in the auditorium. You can dedicate a seat to yourself, a family member, loved one, business, etc. To find out more information and to dedicate your seat, download the form via the link below.